My good friend Andrea has come up with a rather clever new aerial apparatus called Flyweight Chains involving a bundle of chain of similar mass to to the performer's body weight acting as a counterweight. 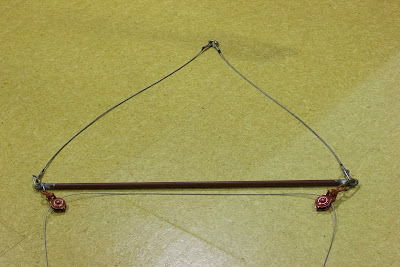 Now the main issue with the system has been, the pulleys have to be rigged a very precise distance apart with the correct orientation to the audience. At cabaret this wasn't an issue however the requirements have limited the number of possible locations that the apparatus can be successfully be setup. After many many many different iterations, the design we can up with was to use plain and simple steel pipe for the bar with load rated eyes at the ends. Jez's rocket science method and my "use the scaffolding standards" both came up with a bar that would be good for approximately 2 tons in compression. The cleanest way to buy load rated eyes off the shelf is to use either shouldered eye bolts OR eye nuts, we chose to go with eye bolts that would screw into threaded sockets in the bar. Said sockets are M20 threaded rod coupling nuts, modified slightly on a lathe and welded into the ends of the pipe. Buying the coupling nuts turned out to be a lot cheaper than an equivalent piece of steel and cutting the required M20 internal thread. The final result showing the pulleys, top cables and the free running steel cable. 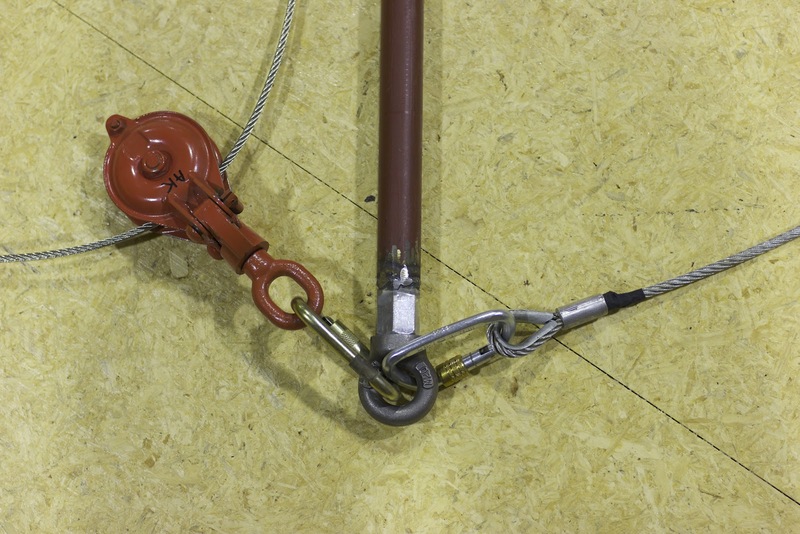 The whole spreader bar and cable assembly was then proof tested at Steel and Tube... They issued the bar with a shiny test certificate proving that it had been tested to 500kg with no signs of distress. Below is the creation in action at The Life You Imagined show in June 2012. 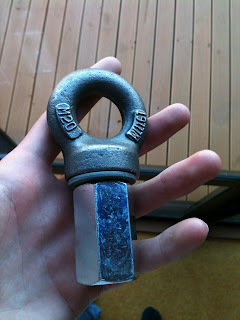 Also see: Andrea's blog post on this spreader bar.